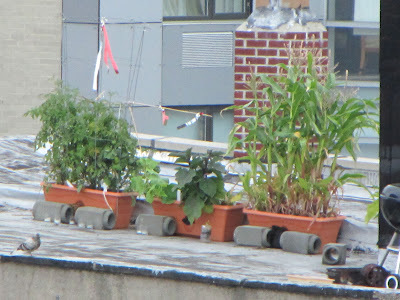 I see this rooftop garden everyday on the commute to and from work. It's near the Williamsburg Bridge on the Brooklyn side of the river. Apologies for the grainy photo, it's several hundred feet from where I shot it. I see tomatoes, eggplant and corn. Can anybody figure out what's growing to the left of the eggplant? I thought it might be cucumber or squash. I think those blocks are there to prevent the planters from tipping over in the wind, I saw the corn on its side once. I assume the shiny ribbons are there to deter birds. Do you think they'll be successful with the corn? I always thought you needed to plant a lot close together to get them to pollinate. Normally I'd think they didn't plant enough corn, but their stalks are so close together that it seems almost impossible for them to not get pollinated. I don't know too much about corn, but I do know it tends to exhaust nutrients in soil more so than most other plants can. Corn will grow over 6 feet tall depending on the variety it is, it's no wonder they blew over. I'm not sure that small container is going to support that many stalks in it. Who ever owns it is going to have to fortify that soil until harvest time is over. If it all works out, than Kudos to that guy! I can not identify what's next to the egg plants.